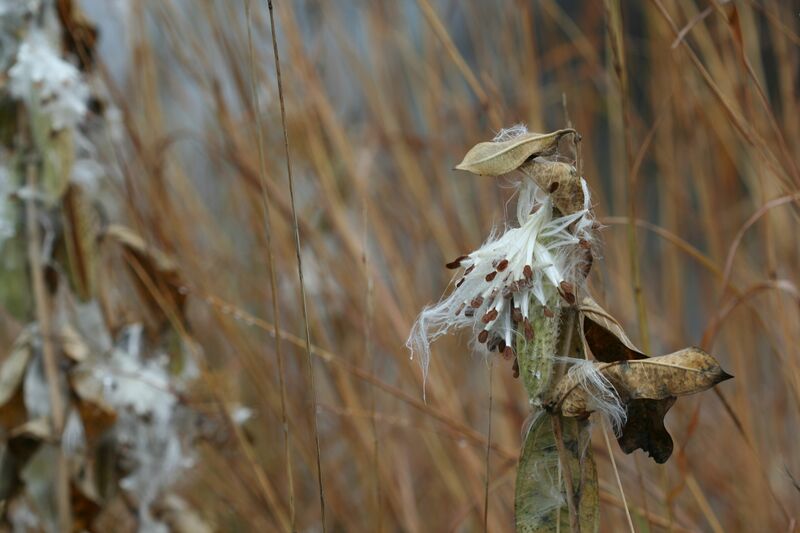 Milkweed pods have split open, sending seed out into the world. We’ve had such a late fall this year that even though it is almost Halloween, we seem to have finally hit peak color where I live, just south of Minneapolis and St. Paul. While walking downtown today, I couldn’t help but notice the vibrant colors of the plantings at our beautiful Northfield Public Library. Bright red burning bush provided a colorful background for seedheads from coneflowers, fading roses and other plants. 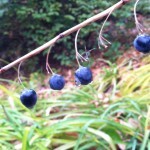 Near the steps, I spotted bright blue berries on on yellowing branches of Solomon’s seal. The same kind of beauty can be seen around the ponds near our house. 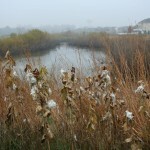 With slight fog and dimmed light, the grasses around the pond seem to be all texture, shades of gold, green and brown. Milkweed pods have burst open and are pushing their seed out into the world. In my home landscape, the ‘Matrona’ sedum are a deep russet color and their sturdy form contrasts with the nodding prairie dropseed, its shoots burdened with the weight of dozens of water droplets. Yes, the weather is damp and chilly. But bundle up and take a walk. This may be the prettiest week of the fall. 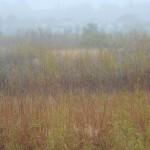 Foggy weather brings out the texture of this natural planting. Ducks are on the ponds, getting ready to depart. Look how big and juicy these berries on Solomon’s seal look. 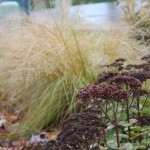 Prairie dropseed (background) is a well-behaved grass for landscapes. Wow! 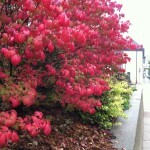 This burning bush looks so bright. 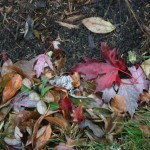 Even the leaves on the ground are pretty now. 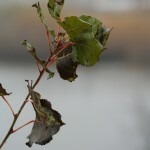 A sapling near the pond. We have had a long fall, too. Color arrived all of a sudden, somewhat late, and ended over the past two frigid nights when all of a sudden most of the foliage was gone. Only beeches and oaks holding on to their leaves right now. I was chatting to a nearby apple grower and he was just shaking his head about climate disruption – which is not always warmer.